Yarn with Pompom and Pattern on Ball Band, Knitting Needles, Sewing Up Needles, Craft Bag to hold your project. 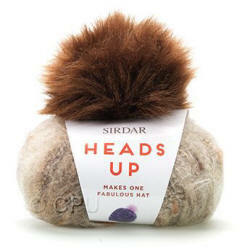 There is a pattern on the Heads Up ball band to make an easy-to-knit hat using 5.5mm and 6.5mm needles. The 50g yarn and pompom kit now costs £3.72 - if you wish, you can add all the optional extras needed to make the hat, and why not add a knitting bag to make an extra special present.